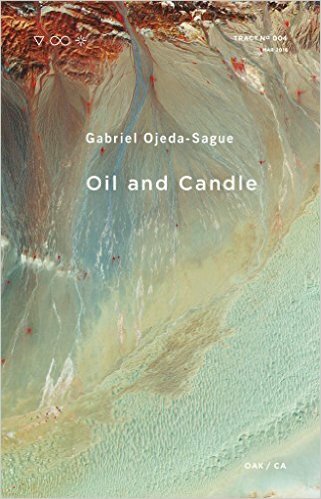 Gabriel Ojeda-Sague’s debut collection, Oil and Candle, opens with the lines: “there is a coded syndrome / of poets who want blood.” A “syndrome / of poets” is like a murder of crows. It spreads out like cancer, which the speaker imagines having, “in multiple places especially my skin.” It is a phrase that pathologizes desire, desire for the blood that’s your own and for the blood that isn’t. In another moment, the speaker watches while poets have a contest “where they hold up / Kleenex soaked with how much blood they can get / out of themselves,” and a white man passes out first. The speaker wishes that hadn’t happened because “every body gets very dramatic about the emotions of / white men.” Habituated responses here are another kind of ritual. 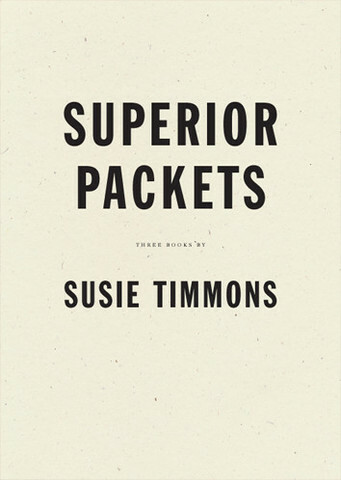 Inexplicable habituation, the poems argue, is what race and ritual have to do with each other. The oil and candle of Oil and Candle are the media of Santería, and at the center of the book’s community of objects. The procedures of Santería’s rituals are both sacred and incomplete for the speaker, who, when performing rituals alone, googles what they don’t know. “[W]hat does / this candle do,” the speaker asks. The speaker calls a number to ask what to do with an abrecaminos candle that’s finished burning and is told to put it in the trash. They drop it into a chute and “hear it go all the way/ down.” A Santería ritual is elsewhere “a useless 7 day ritual.” The poems turn to ritual and let it go and turn to it again. But rituals are necessary, inescapable. The “now” of being a poet is historicized in a biblical past through the performance of rituals: “limpias of poets who trust the police / limpias of poets who poison the apple.” Poetry is and has been forever. Ojeda-Sague’s poems are concerned with how to think about forever and how to balance forevers: the one that’s happened already and the one we have, even if it’s short. There’s no room between what’s imagined and what’s real in these poems. They demand a union of conjecture and practice, of ritual and body and race and city and world in all of their dissonance. Imagined and real in these poems contain facts with which we have to engage, and out of which we might make a taxonomy of what’s hurting us, and of how and why we each hurt differently. 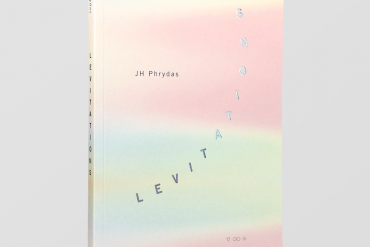 The poems occasion questions: what does it mean to perform rituals for a short future? If every community you’re a part of is hurting, where do you direct your prayers? If you’re offered no futurity, how does that change your relationship with the past? Riffing on the “no future” offered queers whose partnerships don’t reproduce within a frame of heterosexual practice, Ojeda-Sague writes, “I don’t / trust babies.” The poems want to know what to keep on doing out of respect, and where to draw boundaries and what kind of hope to draw within them. The poems make us complicit in what they imagine. They ask to define the limits of what we’ll witness, of what we’ll live with. They’re brave poems. They ask us: “do you have parameters / too”? 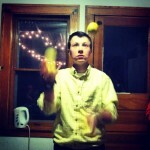 Davy Knittle‘s poems and reviews have appeared or are forthcoming in Denver Quarterly, Fence, The Brooklyn Rail and Jacket2, and his collaborations with Sophia Dahlin have appeared recently in Eleven Eleven. His second chapbook, “empathy for cars/force of july,” is forthcoming from Horse Less Press in April 2016. He lives in Philadelphia.